Gammel Dam, Aspen, Colorado. CCY Architects. “Gammel Dam is a modern family retreat inspired by a rugged, simply crafted cabin in the Morgedal region of Norway where the client’s family have been gathering since the 1950s to enjoy nature and build memories. 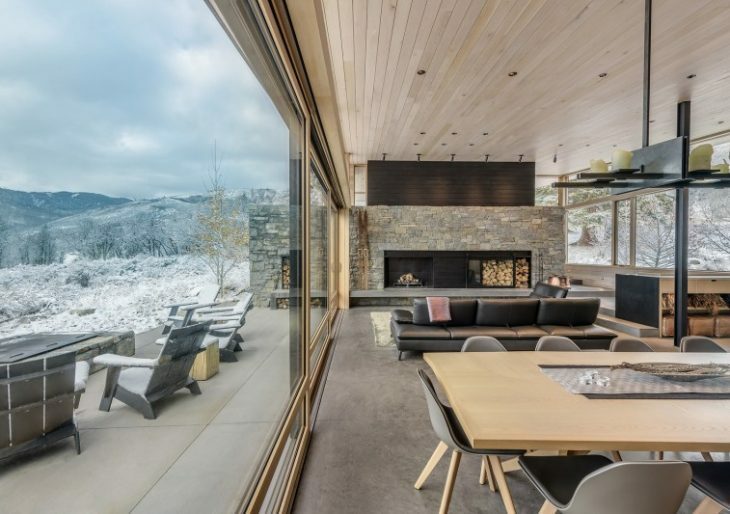 Located on a remote, 11.76-acre sagebrush and scrub oak covered site near Snowmass, Colorado, the residence rests at the base of a steep, curving ridgeline to the northwest, and transitions to a gently sloping grade to the southeast overlooking Snowmass ski area and the White River National Forest. To provide seclusion and privacy, it sits at the interior of the site among existing aspen groves, scrub oaks, sage, and several large spruce trees. Orienting the residence on an east/west axis maximizes the primary views from interior spaces while engaging the immediate landscape through the integration of the building with the sloping grade. Program elements are pulled apart to allow them to adapt to the existing landform while a singular sloped roof unifies them and parallels the natural grade, further reinforcing the building’s relationship to the existing topography. This allows the landscape to flow beneath the roof and between building elements to create covered outdoor spaces. At these locations, interior spaces extend into the landscape, layering together the experience of site and architecture. 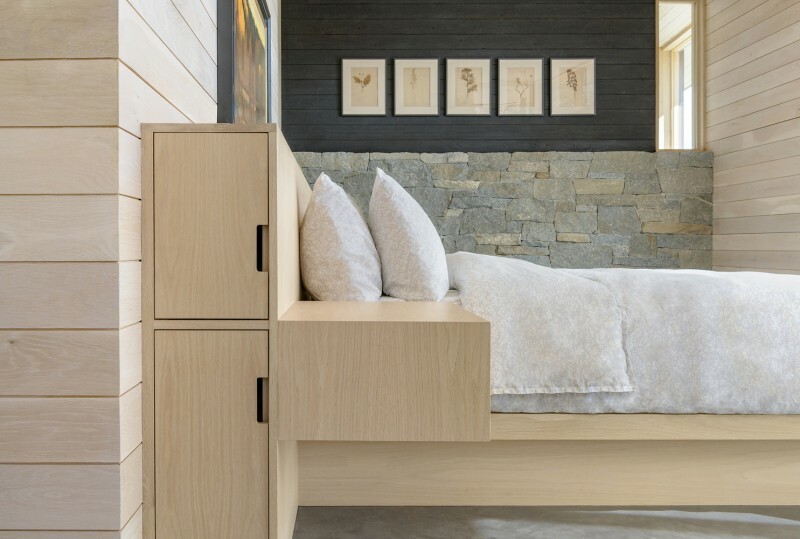 Scandinavian sensibilities are evident in the owner’s furniture selections, the architect’s material palate and detailing, and the quiet interiors. Illuminating the dining table is a custom steel candle chandelier (designed by CCY Associate Gage Reese). Vertical screens crafted from the exterior wood siding provide a diaphanous quality at key moments, softening the modern aesthetic. Gammel Dam is a base-camp for family and guests to get outdoors. The home is designed to live as a one-bedroom cabin for two when the clients are not entertaining family and friends but flexible living spaces easily accommodate up to 14 additional people in the guest wing. The sauna and spa offer relaxation while fireplaces act as gathering places inside and out. Stacked walls of chopped wood are woven throughout the project’s exterior. The husband’s love of fire and chopping wood is illustrated by his collection of hatchets and axes within the detached shed, which also serves as a private office.